Yelling. Screaming. Temper tantrums. Kids can really test our patience sometimes, can’t they? No wonder we act just like them. “But I don’t WANT to go to school today!” My five-year-old crossed her arms over her chest and glared at me in a standoff. “School is a happy place. I can’t wait to pick you up and hear all about the fun you had. Now put on your shoes and let’s go.” See? Momma can keep her cool just fine. “Mom, we’re going to be late.” My eight-year-old stood at the door with her backpack slung over one shoulder. “We’re not going to be late, because we’re all going to get our shoes on and our tushies into the van this very minute.” I felt my teeth start to grit and my nostrils flare. Hold it steady, woman. Don’t blow it now. Bwuaaaaaaahhhh!!! What do you mean you don’t know where your shoes are they were here just a minute ago and are you little people going to do this to me AGAIN today seriously I am ready to jump out the kitchen window and let you WALK TO SCHOOL!!!!! Okay, I didn’t really say that. But I wanted to. 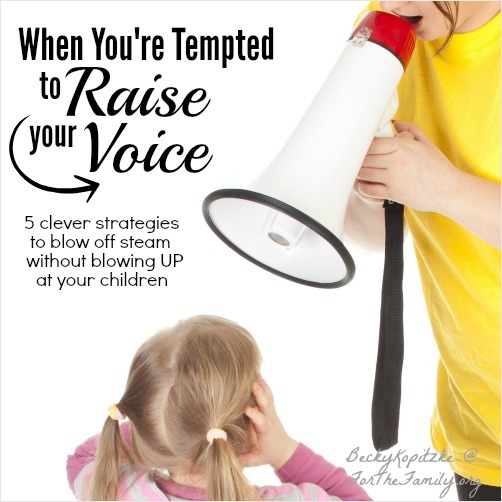 When parenting trips our tantrum trigger, the easy response is to blow. It’s much harder to do the right thing and practice self-control, that elusive fruit of the Spirit. But does that mean we have to stuff down our frustration? Or can we let it come out another way? A more effective, harmonious, merrily-we-roll-along sort of way. Here are five goofy strategies to help you blow off steam without blowing up at the kids. 1. Sing a song. No, really. When you’re feeling the urge to purge your vocal cords, try belting out a tune instead of hollering. “Shout to the Lord” works great (ha ha) or, if you’re a count-to-ten kind of parent, then I recommend the Sesame Street version. Not only can this strategy help loosen your cranky pants, but the kids will look at you funny and maybe even start to laugh. So there you have it. Problem solved. 3. Mimic your child’s behavior. This is not healthy for older kids, but I’ve found it works wonders with the toddler set. For example, if your little one is whining and thrashing about not being allowed to eat a cookie, then start whining and thrashing, too, saying, “I know, I really wanted a cookie! Cookies are so tasty!” You’re not mocking them; you’re communicating at their level—and holding a mirror to their behavior, until they beg you to stop. 4. Dance. It’s purely scientific. When your kids irk you, your body generates a surge of cortisol. We think we want to release these “fight or flight” hormones by screaming, but that only hurts everyone more in the end. So instead, try burning off your frustration with exercise—namely, dancing! A sudden burst of the cabbage patch will confuse your kids long enough to forget about what they were whining about in the first place, and it’ll help you switch mental gears, too. “So let us come boldly to the throne of our gracious God. There we will receive his mercy, and we will find grace to help us when we need it most” (Hebrews 4:16, NLT). I have joined in on the floor thrashing and whining!!! Totally works and it brought us both to laughter!!! Now onto the dancing and counting pentatonix sesame street style!!!! I love this so much!!!!! Praying….I am praying so much. Thank you Lord that we can talk to you all day everyday, and thank you for Becky and her creative ways to help us be better moms and have fun in the heat of the moment!!! THank youu! WOnderfully simple and so very encouraging and helpful!